You are here: Home » MEDIA » Books » Low Chicago: A Wild Cards Novel book 27 edited by George RR Martin (book review). 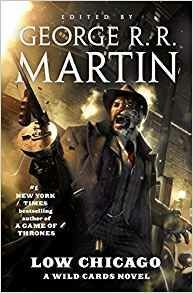 Low Chicago: A Wild Cards Novel book 27 edited by George RR Martin (book review). Throughout all the ‘Wild Cards’ books, despite using poker terms for their titles, this is the first time we actually see a poker game taking place. The players include Aces with some Jokers as their supporters in a winner-takes-all game in Chicago. The only problem is that there is some disruption and one of the aces teleports most of them away. Not just away but into the past. Some back to the 1950s and others only a decade or so back or even further, so there is plenty of scene changing variety. ‘Wild Cards’ veteran John Jos. Miller providing the thread for the Sleeper and the long-lifed John Nighthawk to return everyone to the present time. Oh, only organics went so everyone arrives Terminator-styled, buck-naked. The real trick now is picking out story threads without giving spoilers. Fans of Todd ‘TT’ Taszycki aka Hardhat will be pleased to see his origin story here although I was surprised how his ethnicity was concealed. Not that should make any difference but you are supposed to imagine the characters and it would make more sense to his family ties. Oh, the half-tiger Joker/Ace on the book cover is called Khan. In ‘Stripes’, he arrives just prior to the Valentine’s Day Massacre and changes events, mostly because he needs a job and he likes to bodyguard. I found with some of the stories, I was breezing through at speed but ones like this, by Marko Kloos in this instance, I was amazed by not only taking longer but kept my attention throughout. Most of the main five stories kept my attention throughout. Melinda Snodgrass presents Noel Matthews appearance back in 1968 with the riots going on in ‘The Sister In The Streets’. He bewitches an activist nun, Sister Mary-Catherine, as he is suffering some serious wounds. Matthews is also an Ace assassin, able to switch between sexes and can teleport anywhere in the world. Knowing where the future will lead, he also ends up being the one doing the most damage by assassination. This is also a nicely set up story and we also get to see the great and powerful Turtle once again. ‘Meathooks On Ice’ by Saladin Ahmed takes Ali Husseini back to the Ice Age where he slowly becomes a member of a tribe there. It’s interesting to note that he is thought to now be responsible for adding the Wild Cards gene to human DNA. I had a think about that and although our current DNA can be attributed to only a few ancestral sources, I do wonder as to whether that would be possible for one gene marker. Mind you, it would explain why not everyone was affected by the virus. A weird thing struck me as a lot is made about the butterfly effect during the course of this book. In other time travel stories, sending time travellers to retrieve other time travellers who might or who have messed about with history and putting things right isn’t unusual. This time, the various Aces and Jokers have been spread across time but no one has thought that some of the repercussions would have bounced from one to the other. Yes, the effects of 1968 where a couple presidents in waiting were assassinated was shown but when you consider some were sent further back, you would surely have a domino effect. More so, as some elements of history were changed more subtly than others. What is important about ‘Low Chicago’ is that it has again shown that ‘Wild Cards’ can throw out something to shake the mix from time to time but make a note not to get into any poker games with these people. « Ravencry: The Raven’s Mark book 2 by Ed McDonald (book review).